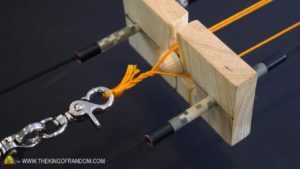 One of the most important pieces of survival gear to have is rope, and it is definitely something you should have in your Bug Out Bag for wilderness survival.This video series shows the build of a Simple Rope Making Machine at home using materials that you can get at your local hardware store.There is no such thing as prepping for survival without having rope and cordage in your stash.You can use them for fishing lines, bowstrings, trap triggers, snares, lashings, and many other things.And do you know what items would be the first to become unavailable in a crisis? There are a few, and cordage and rope will be among them. Previous articleHow to build a Powerful Solar Powered Homemade Air Conditioner. Blows cool air for hours. Next articleHow to build a Simple Homemade Water Distiller.Great for emergency or everyday use.